• In a wok (kadhai) heat oil and sauté red chillies, garlic, peppercorns, green chillies, onion. Remove from heat and allow it to cool. 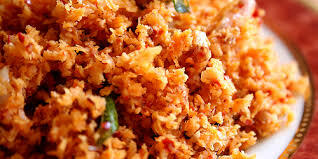 • In a mixer, take the coconut and the sautéed spices along with 2 tbsp water and grind to make a smooth paste. • Add lemon juice, salt and blend again. • Serve and enjoy !